The Islamic State of Iraq and al-Sham (ISIS) declared the establishment of what it termed the “Islamic Caliphate” on Sunday, June 29, 2014, the first day of Ramadan. As part of this announcement, the group stated that it was dropping the “Iraq and al-Sham” modifiers from its name, becoming simply the “Islamic State” (IS). In this announcement of an Islamic Caliphate, Abu Bakr al-Baghdadi, the leader of ISIS, has made a power grab for leadership of the global jihadist movement. He has not only mandated that every Muslim pledge bayah [allegiance] to him as the new Caliph; he has also nullified the legitimacy of any other Muslim group or association, including that of al-Qaeda affiliated groups loyal to Ayman al-Zawahiri, the successor to Osama bin Laden. Al-Baghdadi believes, as former al-Qaeda in Iraq leader Abu Musab al-Zarqawi believed, that success on the battlefield is the highest form of legitimacy. Thus it is fitting that al-Baghdadi has chosen to declare the Caliphate as ISIS increases its territorial control. 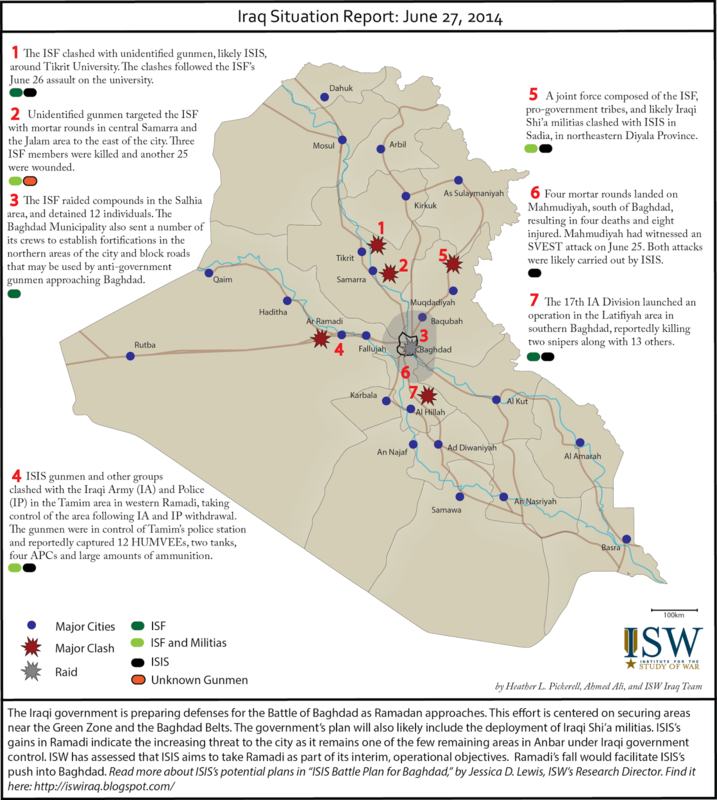 The Islamic State’s boundaries already extend from “Aleppo to Diyala,” as the statement notes, but the declaration of the Caliphate is meant to spark a global phenomenon. In an audio statement disseminated by al-Hayat Media Center and al-Furqan Foundation in five languages, Islamic State spokesman Abu Muhammad al-Adnani outlined the shape of the new Caliphate. • The Caliphate statement is directed at Muslims around the world. The statement calls on all Muslims to pledge allegiance to the Islamic State. Adnani is expressing confidence that he has enough international support from the Muslim community to sustain and grow the movement. • Adnani also goes to great lengths to account for those who may have doubts about the legitimacy of the new Caliphate, asking Muslims to ignore those who “attempt to raise misconceptions.” Say to the skeptics, continues Adnani, that "We had the ability to establish the khilafah ... so it became an obligation for us to do so." This highlights that the Caliphate did not come into existence gradually through the consensus of the Muslim community, but was established by fiat. Emphasizing this point further, Adnani says "We spilled rivers of our blood to water the seeds of the khilafah, laid its foundation with our skulls, and built its tower over our corpse." The Islamic State derives its core legitimacy through decisive battlefield victory, rather than consensus. • Adnani is claiming that the Islamic State is now the legitimate leader of the Muslim community, and thereby claims his ascendancy over al-Qaeda leader Ayman al-Zawahiri. With regard to other organizations outside the Caliphate, Adnani says “the legality of your groups has become invalid.” This poses a major challenge to al-Qaeda aligned groups still loyal to Zawahiri, including Syria's official franchise Jabhat al-Nusra. Abu Bakr al-Baghdadi has calculated that the increased support his group will garner internationally outweighs the potential backlash from al-Qaeda and its affiliates, particularly since he has real military power and financial resources of his own. In addition, by declaring the Caliphate, al-Baghdadi has complicated future cooperation with groups outside the Islamic State such as the Ba'athist group JRTN and Ansar al-Islam in Iraq. 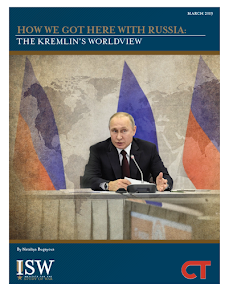 • Adnani does mention the West and America by name, but does not go into detail other than general denunciations of secularism and Western society. He specifically mentions America, Britain, and France as countries which have contested the idea of an Islamic State. • Adnani claims the Caliphate was declared only after careful internal deliberation with the Shura council of ISIS and other senior leadership. The announcement was made only after all preconditions were met. Preconditions include appointing walis [governors] in each province, appointing judges, establishing courts, collecting jizyah and fay [a tax or money taken from non-Muslims], and collecting zakat [alms]. 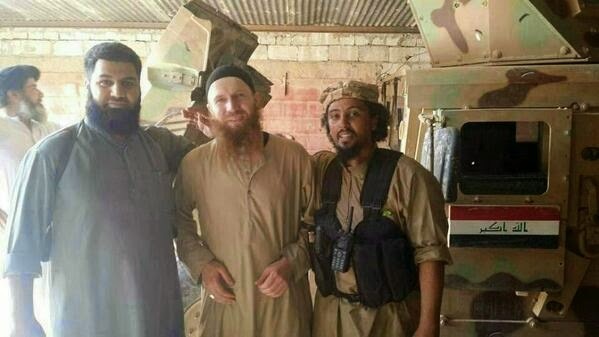 • The declaration comes only one day after Islamic State military commander Abu Omar al-Shishani was photographed with Adnani on the Iraq-Syria border. In addition, the Islamic State released an English language video called “The End of Sykes Picot” featuring an English-speaking Chilean jihadist. The announcement is a bold step, taken as a sort of “political offensive” timed to coincide with the start of the month of Ramadan and an ongoing military offensive that has led to the capture of significant amounts of territory across Iraq and Syria. This play for power is certain to have repercussions, particularly as other groups in the region evaluate how to respond. ISW will continue to update with reactions and a further discussion of the far-reaching consequences of this declaration. 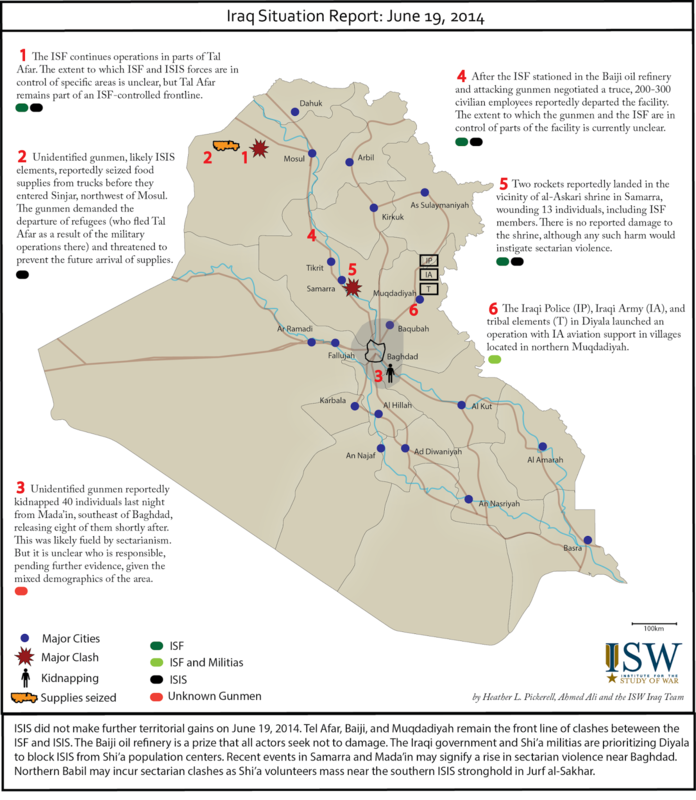 "ISIS in Iraq: Battle Plan for Baghdad" - Coming Soon! ISW’s Research Director, Jessica Lewis, former active duty Army intelligence officer in Iraq, lays out her forecast of ISIS’ next steps as it seeks to destroy the Iraqi state, eliminate the Iraqi Army as a threat, and establish its regional foundation. 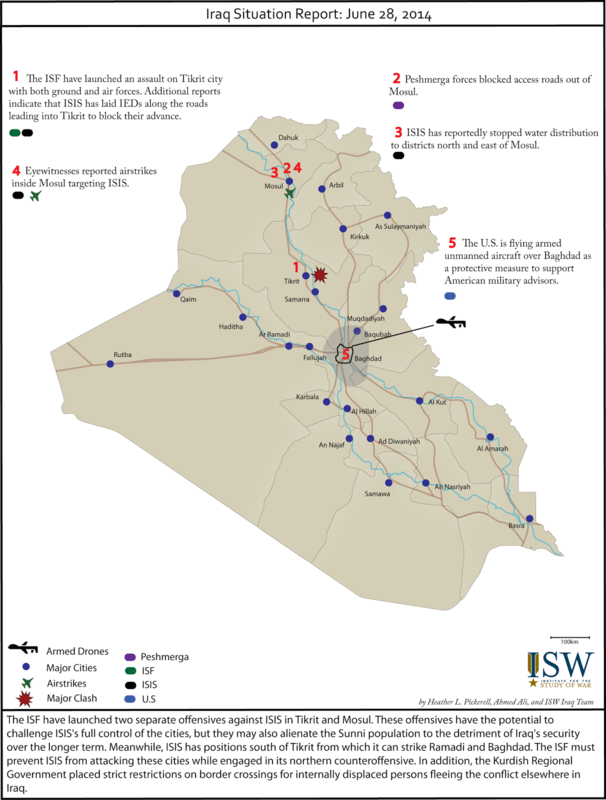 There are indications that ISIS is about to launch into a new offensive in its Iraq campaign. ISIS published photos of a military parade through the streets of Mosul on June 24 showcasing the US military equipment, including armored vehicles and towed 155mm guns. ISIS reportedly executed another parade in Hawija on June 26. These parades may be a demonstration force to reinforce their control of these urban centers. 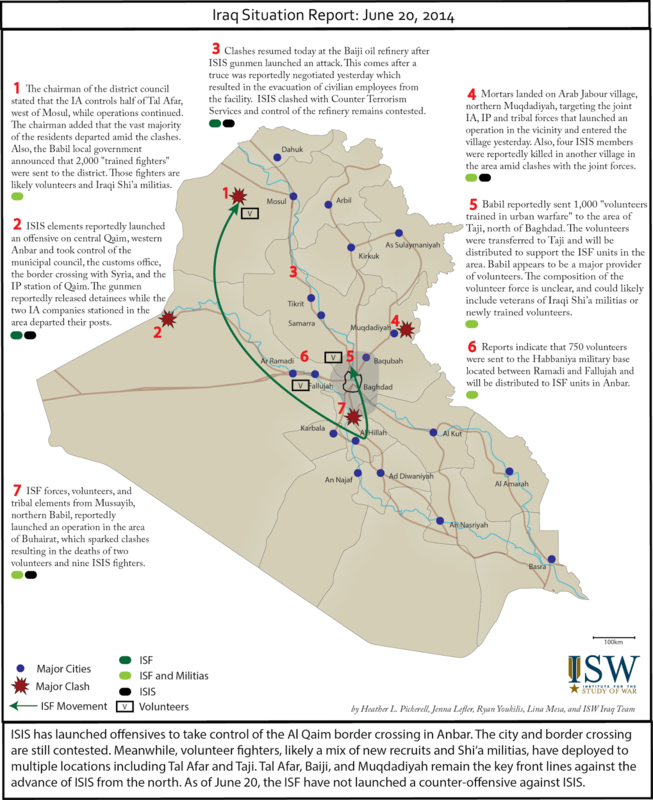 They may also be a prelude to ISIS troop movements, and it is important to anticipate where ISIS may deploy these forces forward. Meanwhile, ISIS also renewed the use of suicide bombers in the vicinity of Baghdad. An ISIS bomber with a suicide vest (SVEST) attacked the Kadhimiya shrine in northern Baghdad on June 26, one of the four holy sites in Iraq that Iran and Shi’a militias are most concerned to protect. 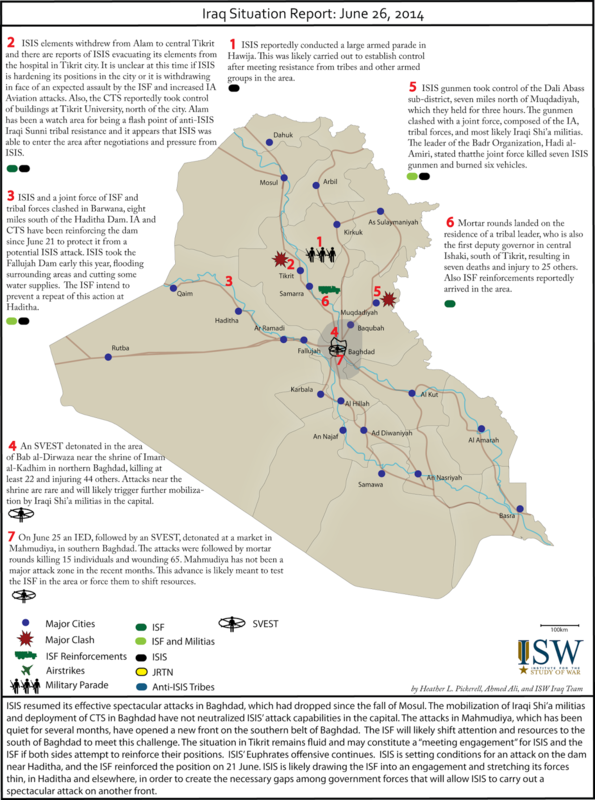 ISIS also incorporated an SVEST into a complex attack in Mahmudiyah, south of Baghdad, on June 25, in a zone primarily controlled by the ISF and Shi’a militias on the road from Baghdad to Karbala. These attacks are demonstrations that ISIS has uncommitted forces in the Baghdad Belts that may be brought to bear in new offensives. Key takeaway: ISIS resurgence in Iraq has had security implications in Lebanon. Renewed operations by Syrian rebels in the Qalamoun region could increase spillover of the Syrian civil war into Lebanon and revive rebel groups’ ability to attack Hezbollah strongholds in Lebanon. The mobilization of Sunni extremist groups in Lebanon in response to ISIS success in Iraq is also possible. However, joint operations between Hezbollah and Lebanese security forces have thus far been successful in mitigating these threats. In early 2014, a spate of car bombs connected to Jabhat al-Nusra and ISIS targeted Hezbollah strongholds in retaliation for Hezbollah’s participation in the Syrian conflict. In response, the Lebanese security forces conducted operations in Tripoli and the Beqaa valley which were largely successful in cracking down on extremist networks that were facilitating and conducting these attacks. 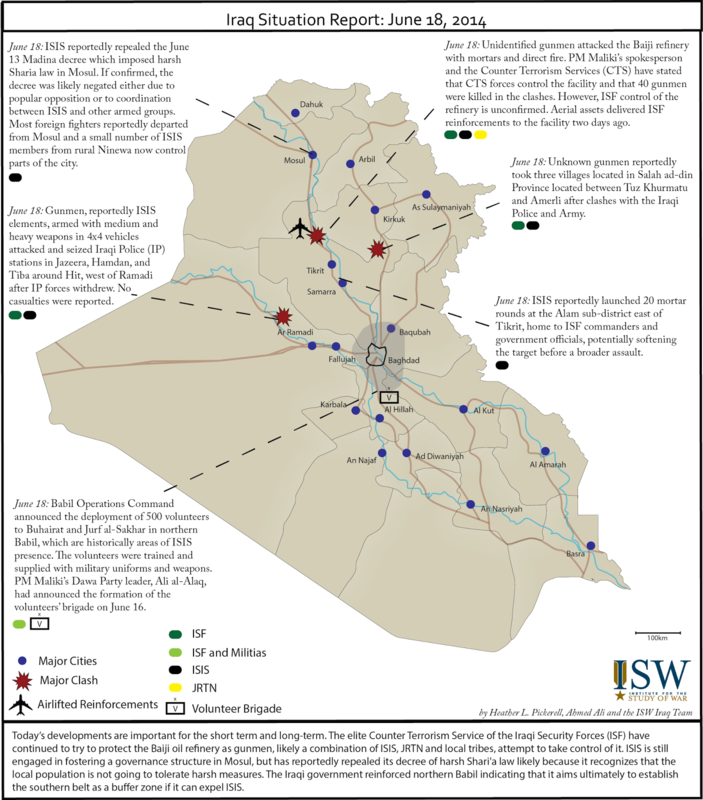 On June 20, a thwarted assassination attempt and a suicide car bomb on the Beirut-Damascus highway disrupted a period of relative calm, underscoring the potential security implications of ISIS resurgence in Iraq for Lebanon. As ISIS continues operations in Iraq, the redeployment of Iraqi Shi’a militia fighters from Iraq to Syria has exacerbated the regime’s manpower limitations, allowing Syrian rebels to renew offensive operations in the Qalamoun region along the Lebanese-Syrian border. Increased border instability and the potential for Qalamoun to reemerge as a staging ground could give way to renewed attacks against Hezbollah strongholds in Lebanon. The mobilization of Sunni extremist groups in Lebanon in response to ISIS success in Iraq is another possible security threat. In the weeks following the seizure of Mosul, Hezbollah and the Lebanese security forces launched a number of joint preventative operations, to tighten security in Beirut, the Dahiyeh, the Palestinian refugee camp of Ain al-Helweh, and in the border towns of Arsal and Tfeil. In the coming weeks these measures may also extend to curb potential activity in Tripoli and the northern district of Wadi Khaled and to protect other Hezbollah strongholds throughout the Beqaa Valley such as Hermel. 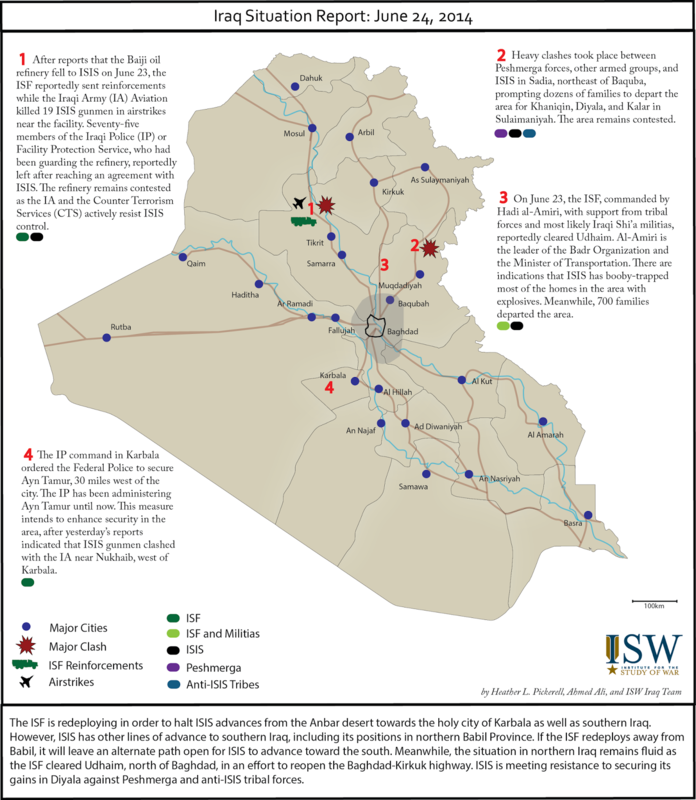 Despite the upset caused by the attempted attack on June 20, operations between Hezbollah and Lebanese security forces thus far appear to have been effective in mitigating the risks posed by ISIS expansion in Iraq. With the exception of major gains by Syrian opposition groups in Qalamoun, it is unlikely that events in Iraq will cause a major escalation of kinetic activity in Lebanon. A car bombed detonated at the Dahr el Baidar checkpoint in the Beqaa valley on June 20. Originally the car was headed to Beirut along the Beirut-Chtaura highway before turning around and fleeing eastward when the Internal Security Forces (ISF) attempted to stop the car. The explosion killed one ISF member and injuring 33 other individuals. Moments prior to the detonation, the convoy of Director-General of the Directorate of General Security (DGS) Major General Abbas Ibrahim passed through the checkpoint, making the bombing a possible assassination attempt. Notably, General Abbas oversaw the operations in Tripoli which forced radical sheikh Ahmad Assir into hiding in the summer of 2013.The Free Sunnis of Baalbek Brigade later claimed responsibility for the bombing, “vowing to reach the initial target of the attack in the future.” The Free Sunnis of Baalbek Brigade is a Sunni extremist group, best known for claiming responsibility for the assassination of senior Hezbollah operative Hassan al-Laqis in December 2013. The group claimed allegiance to ISIS via its twitter account. ISIS Damascus twitter account, however, refuted the allegiance. ISF Chief, General Ibrahim Basbous, later stated that the vehicle had been heading for Beirut which, combined with the fact that the vehicle was apparently fleeing from ISF troops west of the checkpoint, casts some doubt on the idea that Maj. Gen. Ibrahim was being targeted. Ibrahim claimed that the bombing was “connected” to a thwarted operation aimed at assassinating Shi’a leader and Speaker of Parliament Nabih Berri in Beirut on the same day (see below). If Nabih Berri was the target of this attack it would fall in line with previous car bomb attacks in Lebanon primarily targeted pro-Hezbollah, Shi’a neighborhoods and towns in Lebanon. Approximately 200 ISF and DGS officers arrested 102 individuals from two hotels in the Hamra district of Beirut. Security forces subsequently released 98 people while retaining 4 men for further investigation with regard to an assassination plot against Nabih Berri, the speaker of Parliament and head of the Amal movement, Lebanon’s second-largest Shi’a political party. The Amal conference at the UNESCO Palace, where Berri was due to speak, was canceled prior to the raids. The arrested men are suspected of being part of a Beirut-based cell affiliated with ISIS. 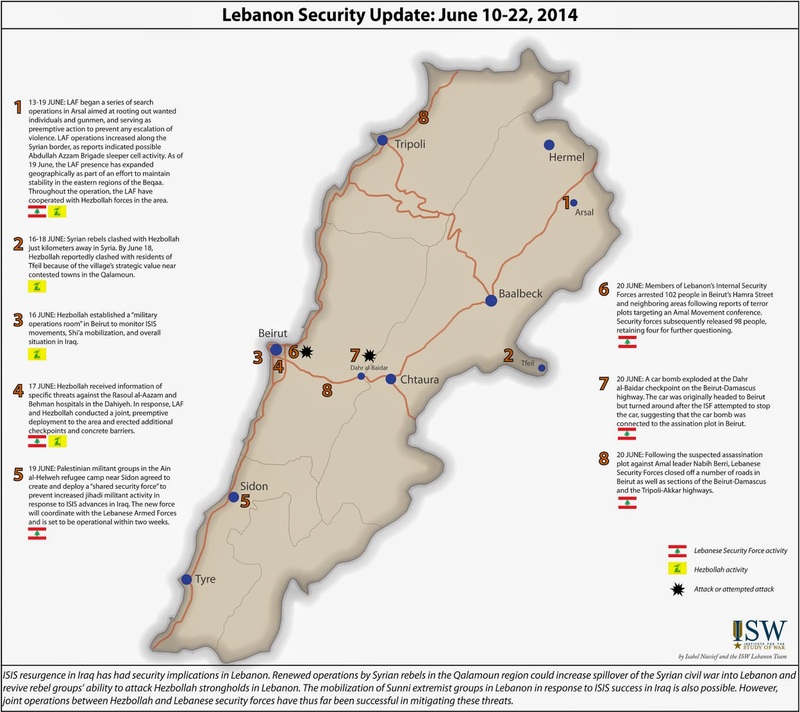 As a result, security in Lebanon has tightened significantly. In Beirut a number of roads were closed by security forces, including the airport road. Security forces also closed off the Beirut-Damascus highway at the Dahr el Baidar and the Tripoli-Akkar highway, and erected a checkpoint at the entrance of the city of Sidon in southern Lebanon. Lastly, strict security measures were implemented around Ain-al-Helweh Palestinian refugee camp in Sidon after reports that several wanted fugitives had managed to escape the camp. 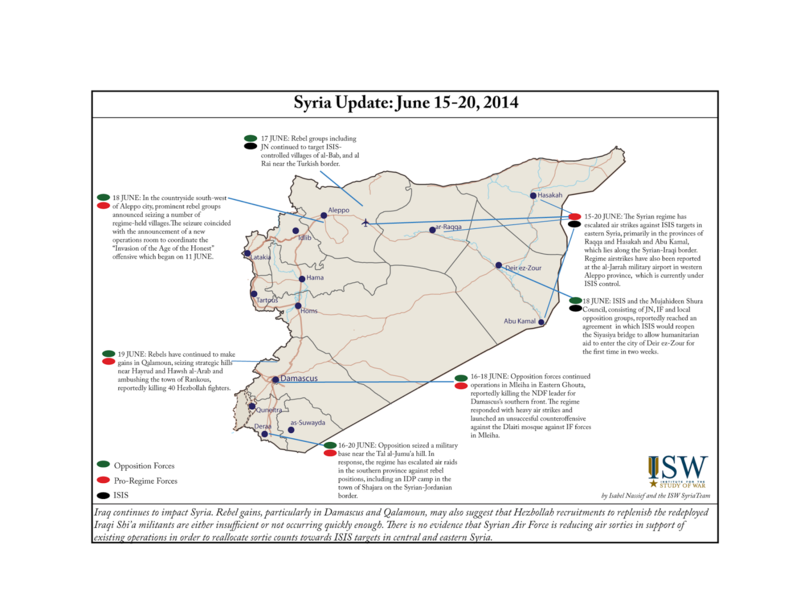 In the last couple weeks, Syrian opposition fighters have renewed their Qalamoun offensive. The rebel offensive was likely bolstered by the departure of Shi’a militia members returning to Iraq from Syria, where they plan to fight a resurgent ISIS. Hezbollah is reportedly dispatching militants from Lebanon to replace pro-government fighters now in Iraq, but recent rebel gains in Syria indicate that Hezbollah is mobilizing quickly enough to replace Iraqi Shi’a militia fighters that have returned to Iraq from Syria. Tfeil, a Lebanese border town in the Beqaa Governorate that is almost completely surrounded by Syrian territory, is a flashpoint in Lebanon. Most Tfeil residents evacuated the area for Arsal and other locations in eastern Lebanon. On June 17, Sunni rebels clashed with Hezbollah just kilometers away in Syria. By June 18, Hezbollah was reportedly clashing with residents of Tfeil because of the village’s strategic value near contested towns in the Qalamoun. During the last Qalamoun offensive in April 2014, residents went months without basic necessities because fighting made accessing the town impossible. Fresh fighting in Tfeil indicates that the void filled by fighters leaving Syria for Iraq is having direct impacts on towns along the Lebanese-Syrian border. The most significant LAF activity since the fall of Mosul has been an increased, and ongoing, presence in the Arsal area of the northeastern Beqaa Valley. Arsal, a town known as major transit point for smuggling and Syrian opposition activity, has experienced a series of armed incidents and kidnappings over the last three weeks – some of which have allegedly involved elements of Jabhat al-Nusra (JN). 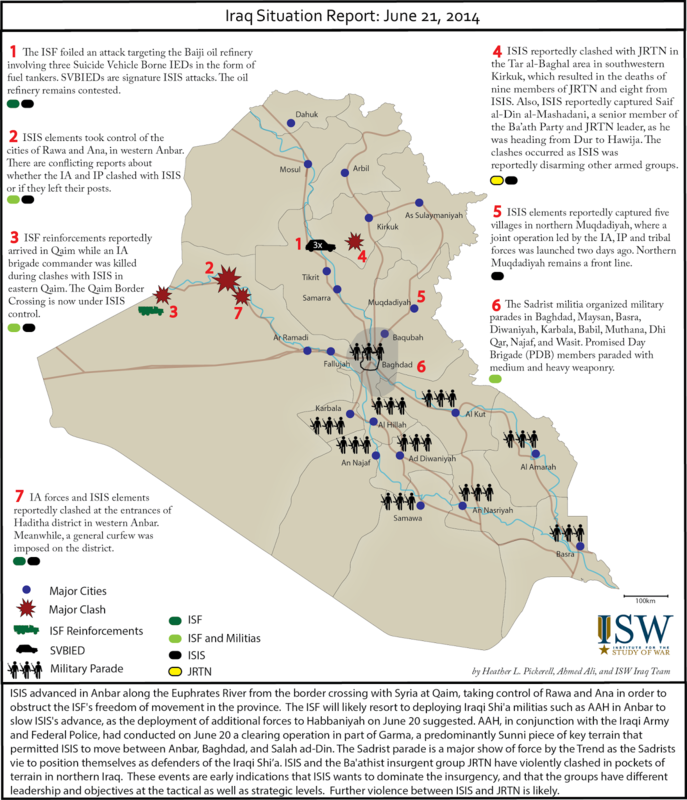 In response to the increasing tempo of incidents and potential for violence in the aftermath of the ISIS advance in Iraq, the LAF began a series of search operations on 13 June aimed at rooting out wanted individuals and gunmen, and serving as a broad scope, preemptive action to prevent any escalation of violence. Within the first day, five to six Syrian nationals were arrested for connections to multiple Sunni terrorist organizations. By 14 June, LAF operations were stepping up all along the Syrian border, as reports indicated possible Abdullah Azzam Brigade sleeper cell activity. Border security intensifications included the deployment of two additional helicopter gunships to the area. As of 19 June, the LAF presence has expanded geographically as part of an effort to maintain stability in the eastern regions of the Beqaa. Throughout the operation, the LAF have cooperated with Hezbollah forces in the area. To date, the only reported casualty has been the wounding of an Arsal resident by LAF fire. Since the fall of Mosul, many have been watching Lebanese Hezbollah with interest to see how it responds to the looming threat ISIS poses to Shia holy sites in Iraq and to the Iran-Iraq border. - June 12: Hezbollah called for a general mobilization of 1000 fighters in Lebanon to be sent to the Sayyidah Zaynab shrine in Damascus, to replace Shia Iraqi militia troops who were returning to Iraq. - June 13: The next day, MP Walid Sakariya of Hezbollah’s Loyalty to Resistance bloc said that Iraq "is bigger than the capabilities of [Hezbollah]" and that Hezbollah would not be involved in operations within Iraq. - June 16: Hezbollah established a “military operations room” in Beirut to monitor ISIS movements, Shi’a mobilization, and Iraqi security. The most pressing question remains whether or not Hezbollah will commit fighters directly to the Iraqi conflict, or just increase its presence in Syria to fill gaps left behind by departing Iraqi Shi’a militias. Given current information, the most likely scenario seems that Hezbollah will mobilize to backstop in Syria, while also sending some of its better trained officers to act as advisors to forces defending Shi’a holy sites in Iraq. However, recent gains by Syrian rebel groups, particularly in Damascus and Qalamoun, may suggest that Hezbollah recruitment to replenish the redeployed Iraqi Shi’a militants are either insufficient or not occurring quickly enough. As the security situation in Iraq has deteriorated and concerns of spillover violence have risen, cooperation between the LAF and Lebanese Hezbollah has increased as both work to ensure the security of Beirut. 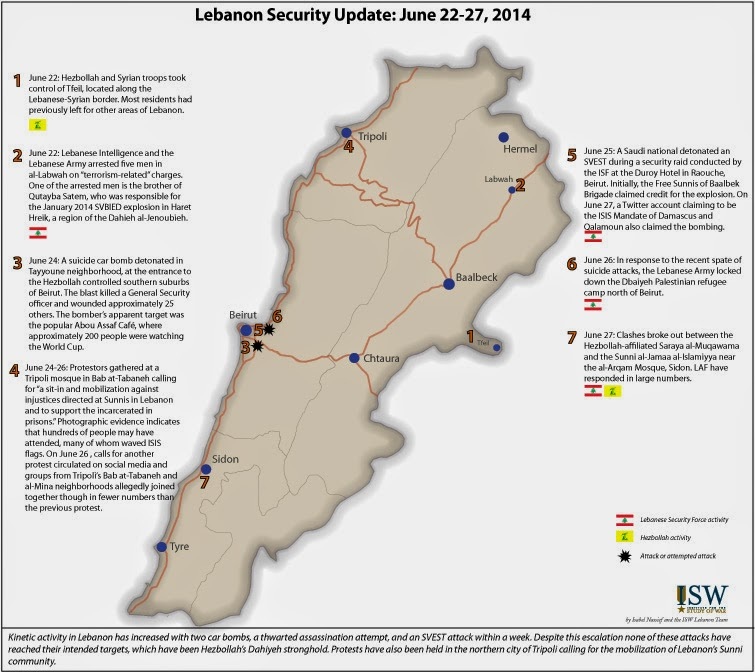 On 10 June, the LAF began implementing a large-scale security plan in the Beirut’s southern suburbs, aimed at preventing further suicide and car bombings like those which targeted the largely pro-Hezbollah area earlier this spring. 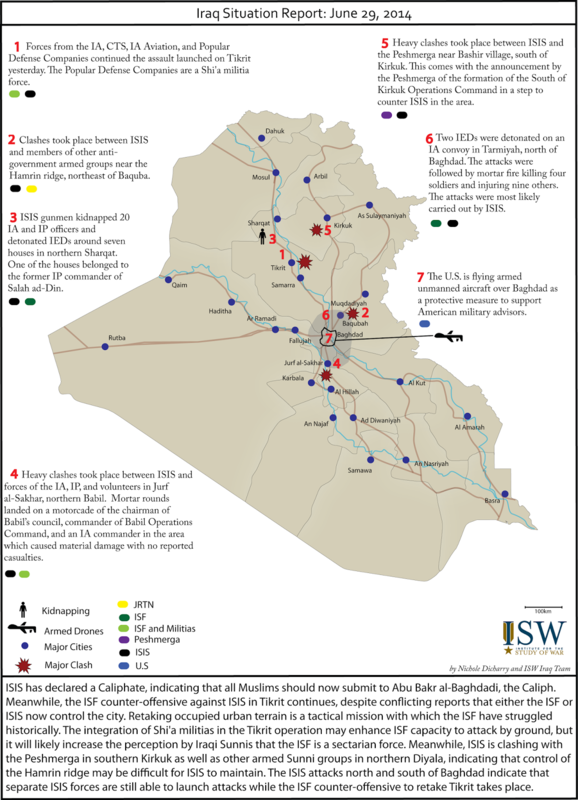 The commencement of the operation happened to coincide with the ISIS seizure of Mosul. Further deployments in Beirut, however, were likely in response to ISIS Iraq operations, as Lebanese actors fear a resurgence of extremist attacks in Lebanon. On 17 June, Hezbollah received information of specific threats against the Rasoul al-Aazam and Behman hospitals in the Dahiyeh. In response, the LAF and Hezbollah conducted a joint, preemptive deployment to the area and installed additional checkpoints and concrete barriers. On 20 June, the ISF arrested four individuals suspected of taking part in an Abdullah Azzam Brigade (AAB) plot targeting hospitals in the Dahiyeh. Also on 17 June, a previously undiscovered Lebanese Civil War-era tunnel was found between the Burj al-Barajneh and Shatila Palestinian refugee camps in the Dahiyeh, prompting messages of concern from both Hezbollah and the Interior Ministry. Fatah later denied ever using the tunnel. Palestinian militant groups in the Ain al-Helweh refugee camp near Sidon agreed to create and deploy a “shared security force” to prevent increased extremist militant activity in response to ISIS advances in Iraq. The new force will coordinate with the Lebanese Armed Forces and is set to be operational within two weeks, though its implementation has been planned and delayed before. The Lebanese Armed Forces have been unable to operate within Palestinian refugee camps since 1969, when the Cairo Afford granted Palestinian organizations sovereignty over Palestinian refugee camps. Radical groups, including the AAB and foreign elements, including Syrians and Chechens, took refuge in Ain al-Helweh earlier this year to organize and plan attacks. Palestinian refugee camps, especially those with dense concentrations of radical elements, remain a major potential flashpoint if regional sectarian tensions flare in response to the crisis in Iraq. In particular, a large Hezbollah intervention in Iraq could prompt extremist groups operating within the camps to attack symbols of Shi’a power within Lebanon. The return of Iraqi Shi’a militias from Syria to Iraq has continued to increase in response to ISIS operations in Iraq. The battlefield implications of this redeployment are most visible in Damascus where Iraqi Shi’a fighters played an important role. Opposition news site Zaman al-Wasl reported on June 19 that the majority of the Iraqi militias operating in Mleiha in the Eastern Ghouta suburb of Damascus have withdrawn from the battlefield and are returning to Iraq. 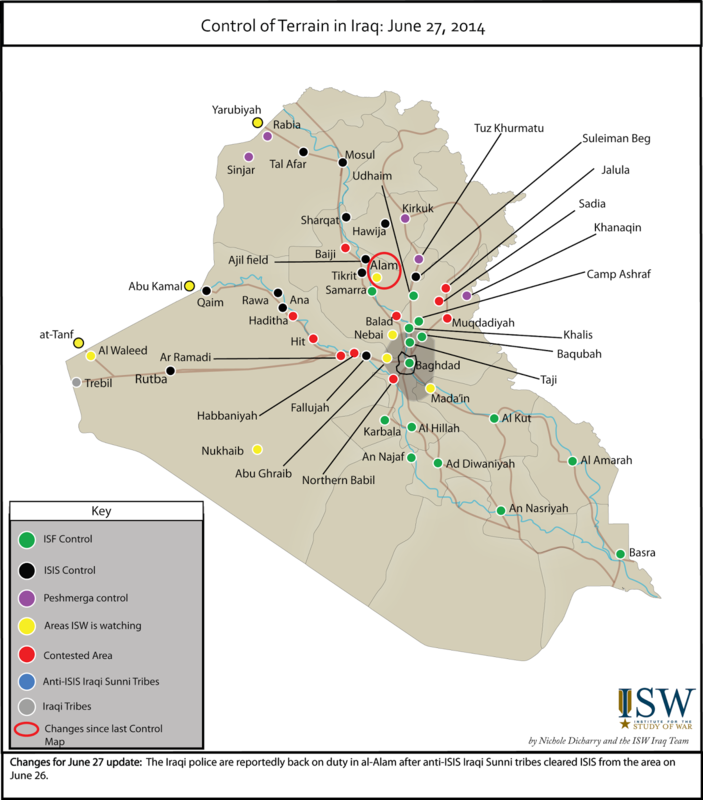 The withdrawal of Iraqi Shi’a militants is having a direct impact on the regime’s forces composition. As rebels have made gains in the Eastern Ghouta suburbs over the last two weeks, the regime has failed to launch a successful counteroffensive. Rebel gains, particularly in Damascus and Qalamoun, may also suggest that Hezbollah recruitments to replenish the redeployed Iraqi Shi’a militants are either insufficient or not occurring quickly enough. Reporting on kinetic activity in Syria by Sham News Network indicates an escalation in overall regime air raids throughout Syria in the last two weeks. Regime air strikes in eastern Syria against ISIS positions have continued to increase since ISIS began its attack on Mosul. It is likely that the expansion of regime airstrikes into eastern Syria will affect its ability to conduct airstrikes in key areas of contestation along the central corridor in western Syria. 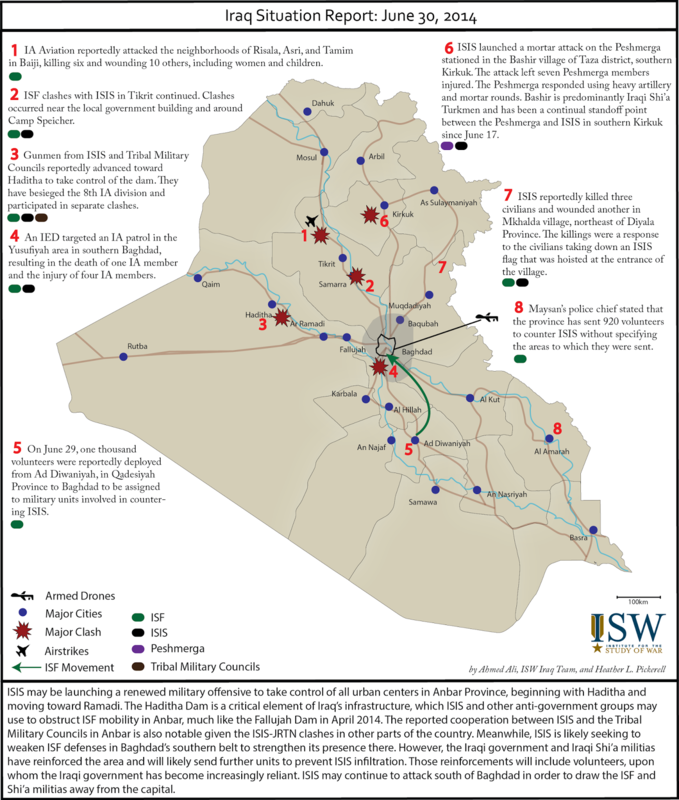 The regime’s reliance on airpower has also increased due to the manpower deficit caused by the redeployment of Iraqi Shi’a militias. To deal with this increased demand on airpower, the regime will likely commit standard ordnances to eastern Syria while concentrating rotary wing strikes and barrel bomb attacks along the central corridor in western Syria. This will allow the regime better precision targeting against ISIS in the east while enabling it to continue air strikes in key areas of contestation. The Syrian Air Force (SAF) continues to show that it is capable of conducting targeted sorties at a distance from its operating bases. The increase in strikes targeting ISIS strongholds in central and eastern Syria, far from the Assad regime’s primary ground operations in and around Aleppo, Homs, Deraa, and Damascus, is evidence that the SAF is capable of fighting on two fronts simultaneously. It is clear that SAF continues to receive significant external, state based logistics and technical support resulting in adequate supplies of fuel, munitions, and spare parts enabling the SAF to operate over the entire stretch of Syrian airspace. There is no evidence that SAF is reducing air sorties in support of existing operations in order to reallocate sortie counts towards ISIS targets in central and eastern Syria. It appears that SAF has generated some additional “surge” capacity to service targets of opportunity in Syria that may be temporarily vulnerable due to increased ISIS operations in Iraq. Recent rebel gains on fronts throughout Syria indicate that opposition forces may be capitalizing on both regime and ISIS vulnerabilities as a result of the escalation of violence in Iraq. *Qalamoun: Rebels have continued to make gains in Qalamoun, seizing strategic hills near Hayrud and Hawsh al-Arab and ambushing the town of Rankous, reportedly killing 40 Hezbollah fighters. *Deraa province: Opposition fighters have also made advances in Deraa province, taking a military base near the Tal al-Jumu’a hill. In response, the regime has escalated air raids in the southern province against rebel positions, including an camp for Internally Displaced Persons (IDPs) in the town of Shajara on the Syrian-Jordanian border. *Damascus: Rebels have continued to make gains in Mleiha over the last two weeks, reportedly killing Captain Rudein Ali Issa, the NDF leader for Damascus’ Southern Front near Mleiha. In an attempt to undo recent rebel gains in the area, regime forces mounted an unsuccessful offensive on June 18 to retake the Dilati Mosque from Islamic Front (IF) forces in Mleiha. The following day the regime launched 23 airstrikes and nine surface-to-surface missiles on Mleiha amid ongoing clashes between rebel forces and the regime. *Aleppo province: In northern Aleppo province, rebel groups including Jabhat al-Nusra continue targeting ISIS-controlled villages of al-Bab and al-Rai near the Turkish border as part of the Naharwan al-Sharq offensive. In the countryside south-west of Aleppo city, prominent rebel groups announced seizing the regime-held villages Buhayra, Mashfa, Qalaya, Dubagha, and Manashir. The seizure coincided with the announcement of a new operations room to coordinate the “Invasion of the Age of the Honest” offensive which began on June 11. In the past week ISIS in Syria has made several unusual moves that suggest the organization is adjusting its posture on the ground as a result of the crisis in Iraq. *After a video appeared online on June 14 showing Abu Haf al-Masri, the ISIS emir of the northern border town of Jarablus, cruelly toying with an old man, the ISIS Wilayat of Aleppo released a statement that al-Masri had been reprimanded and removed from his responsibilities. *On June 15 opposition reporting networks put out an alert that ISIS was removing its flags from its headquarters in several towns in northern Raqqa province including Tel Abyad, al-Sharakrak, and Saluk. ISIS had only weeks before raised a behemoth of a flag in Tel Abyad, which sits right on the border with Turkey. There are no indications that ISIS has withdrawn its presence or relinquished control in any of these locations. *On June 18 aid was allowed to enter the city of Deir ez-Zour for the first time in weeks since ISIS took control of the rebels’ only supply route into the city and cut off access. The aid delivery was the result of negotiations between ISIS and opposition groups in the area and photos from the delivery clearly show vehicles from the Syrian Arab Red Crescent, but ISIS posted photos of the event claiming credit for having “saved” the city. 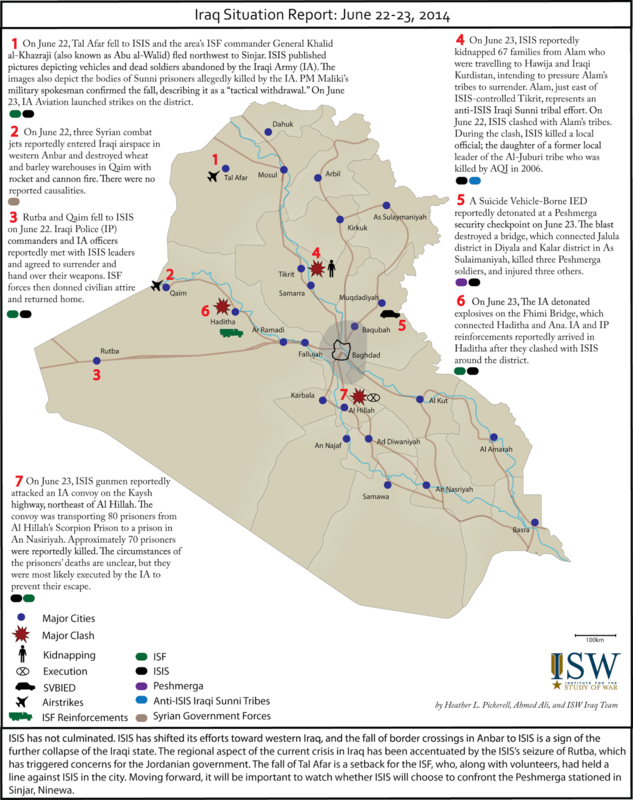 These incidents take place against the backdrop of events in Iraq, where on June 18 ISIS repealed the Medina decree which imposed harsh Sharia law in the city of Mosul. All together this cluster of ISIS actions suggests an internal strategic decision by ISIS leadership aimed at appearing slightly more moderate. 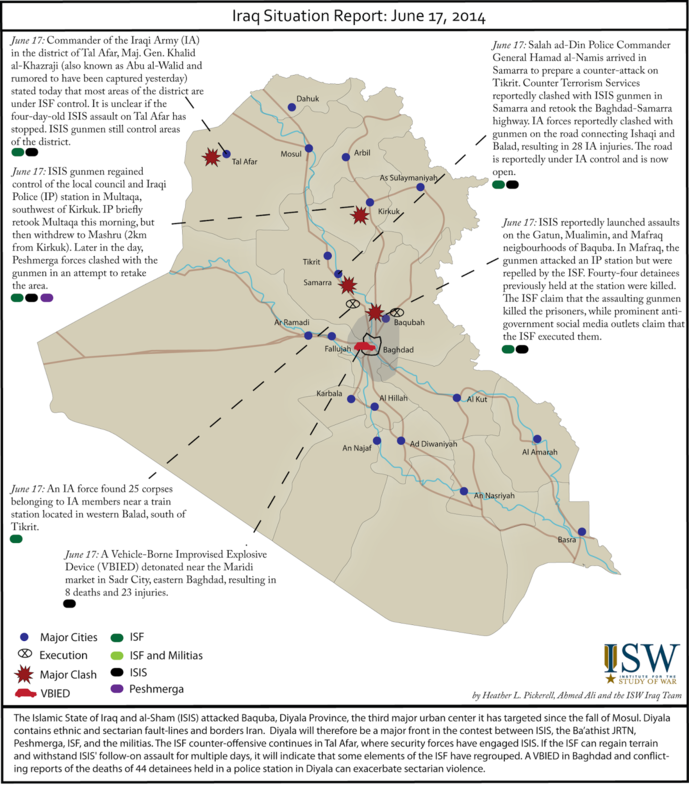 It is not yet clear if ISIS is actually attempting an organizational shift to improve its relationship with civilians or if this is a temporary move intended to lower its profile and lessen backlash in Syria while it is directing resources and attention to the Iraqi theatre. Continuing reports from Syrians living in ISIS-controlled areas of Syria indicate that ISIS has not actually moderated its draconian methods, which means that this cluster of uncharacteristic moves by ISIS is likely just a temporary reaction to the increased international spotlight. ISIS has sustained its campaign in the countryside of Deir ez-Zour province throughout its escalation in Iraq, indicating its continued prioritization of this military effort inside of Syria despite increased pressure from the regime. Although it is possible that ISIS will take an operational pause in Syria to solidify its control and absorb its gains in Iraq, it is likely to move swiftly in a renewed offensive fully to rout JN and rebel forces from the Deir ez-Zour countryside and firmly to establish the lines of control and oil reserves within its state. After the fall of Mosul, widespread celebrations were held throughout ISIS-held territory within Syria in the Aleppo strongholds of Jarablus, al Bab, Manbij, Deir Heifer, and Maskana, with a full parade held in ar-Raqqa. ISIS social media outlets reported wildly on the ongoing advances in Iraq, using the hashtag #SykesPicotOver to celebrate the game-changing successes achieved in Iraq. In addition to the outpouring of support on social media and in the streets of ISIS’s Syrian territory, ISIS commander in northern Syria Omar al-Shishani issued a “general communication” urging support for our “brothers in Mosul.” These celebrations indicate the cross-border resonance of ISIS operations in Iraq and Syria. ISIS firmly solidified its control over the de-facto capital of its emirate in ar-Raqqa city in early 2014. 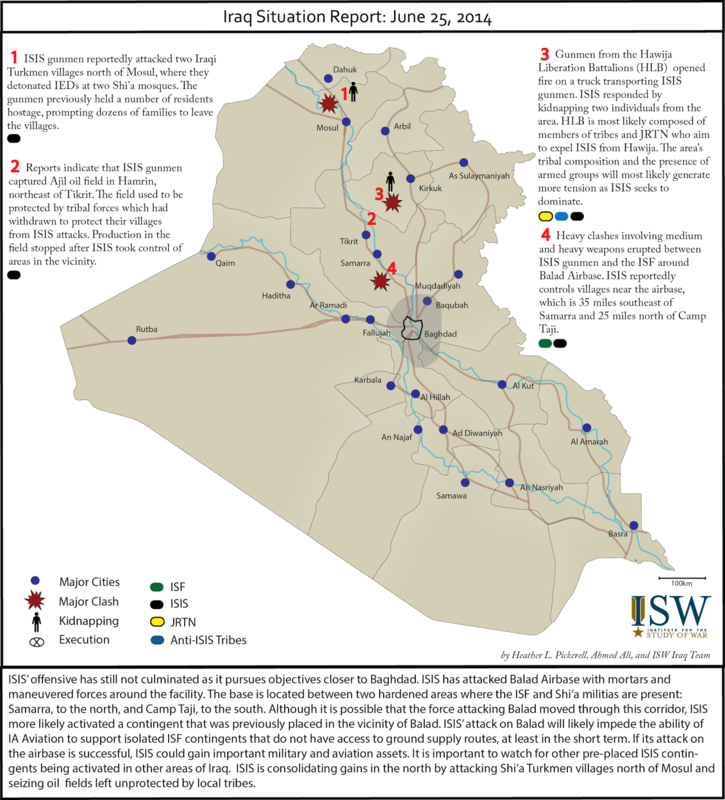 While local resistance to ISIS rule has continued, it has been limited to low-level clashes and civilian protests that have fallen short of posing a threat to ISIS’s control in the area. In northern ar-Raqqa province Kurdish YPG forces regularly target ISIS positions in the countryside surrounding the Tel Abyad border crossing with Turkey, but ISIS has been able to maintain control of the crossing and has engaged in a number of vicious reprisal attacks including executions and kidnapping of Kurdish civilians in an attempt to deter future offensive raids. Tel Abyad is a key strategic location for ISIS, likely serving as a transit point for foreign fighters and supplies into ISIS’s ar-Raqqa stronghold. ISIS has come under increased pressure in Aleppo from rebel groups which have recently launched an offensive to regain territory in the northeast of the province. The Islamic front (IF), Jabhat al-Nusra (JN) and other Islamic brigades initiated a renewed push against ISIS positions in the countryside, seizing a string of villages north of the ISIS stronghold of al-Bab. The objective of the operation is to seize control of the northern border village of al-Ra’ii which is likely used by ISIS as a second route for foreign fighters and supplies. However, although the loss of al-Ra’ii would negatively affect ISIS’s supply routes into its Aleppo strongholds, there have been no indicators that the IF and JN intend to escalate this offensive beyond minor countryside villages and directly attack the ISIS strongholds of al-Bab, Manbij or Deir Heifer. In the absence of a significant rebel offensive against these cities, ISIS is likely to remain secure in its Aleppo strongholds as it transfers weapons, funds, and possibly new recruits into its Syrian theater. ISIS’s offensive to take control of parts of Deir ez-Zourfrom other rebels and to secure critical supply routes between Iraq and ar-Raqqa has met with relative success since it began in March. However, ISIS has been unable to claim a decisive victory as Syrian rebels, tribes, and JN all rallied together in defense of the province. The Mujahideen Shura Council, consisting of the IF, JN, other rebel brigades, and local tribal militias was declared on May 25 to counter ISIS in the province and has continued to challenge ISIS. Members of the council have continuously engaged in clashes with ISIS in the strategic as-Suwar – Deir ez-Zour – al-Basira triangle as they attempt to disrupt ISIS’s attempt to consolidate its supply lines and sources of revenue. 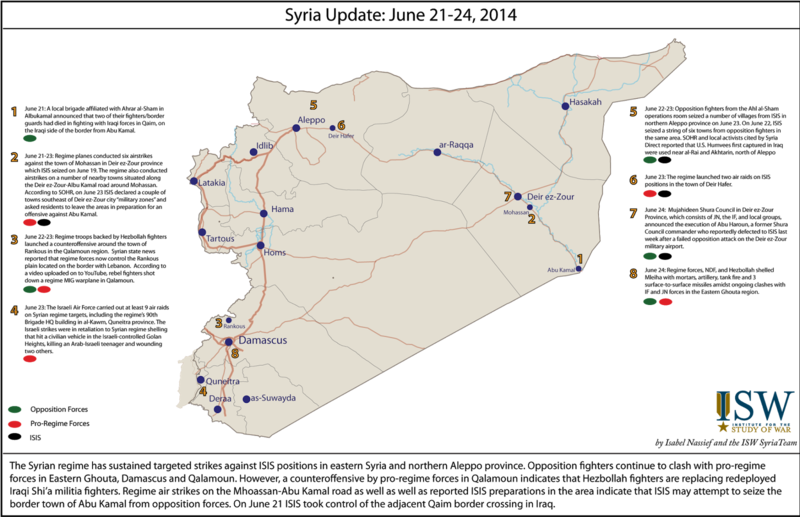 This fighting has resulted in large civilian displacement in the area, prompting the FSA’s Supreme Military Command to declare the province a disaster area and to call for humanitarian assistance. Despite this resistance, ISIS seized a number of countryside villages to the west of Deir ez-Zour city in consolidation of its supply route from Aleppo province, and took control of the bridge connecting the city with the suburbs, cutting off rebel movement and the entrance of humanitarian aid. With the regime still maintaining control of the remaining supply routes into the city as well as a small presence in several northern neighborhoods, the city has been effectively under siege, prompting online activists to launch a campaign under the hashtag #DeirEzzorNeedYourHelp to draw attention to the crisis. 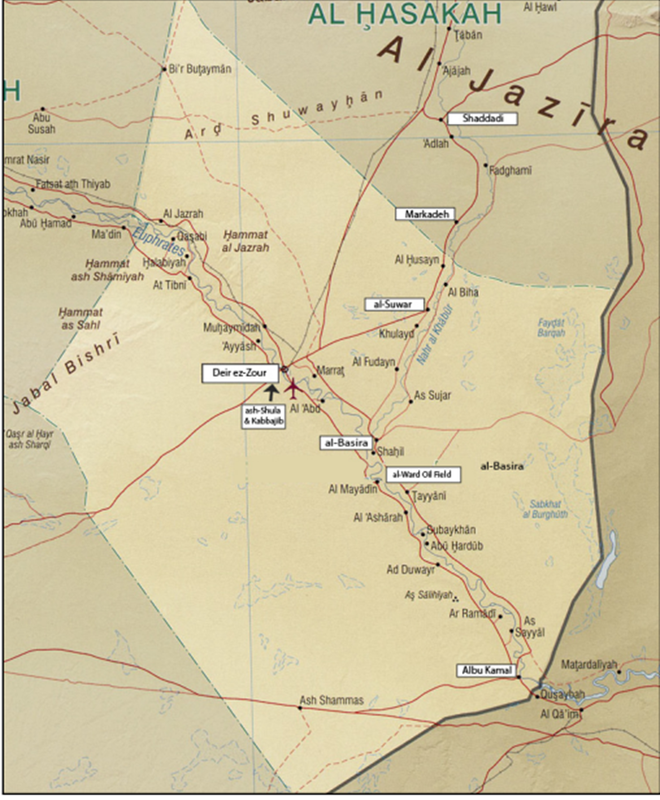 Media reporting on Deir ez-Zour on June 12, 2014 highlighted the ISIS siege of the city and the possibility of an impending ISIS attack to fully secure the city, fears that were echoed by a plea by the SMC to “regional backers” to aid rebel forces in the province against ISIS. 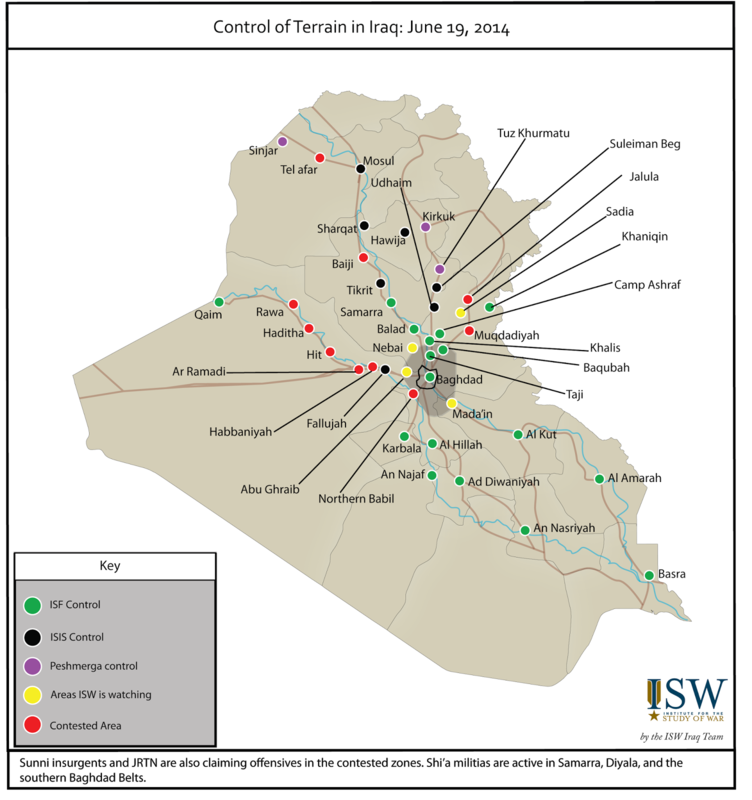 Indicators that ISIS is undertaking a significant transfer of captured vehicles and weapons back into Syria emerged at the very beginning of the currently ongoing Iraq campaign, beginning with the capture of Mosul in early June. 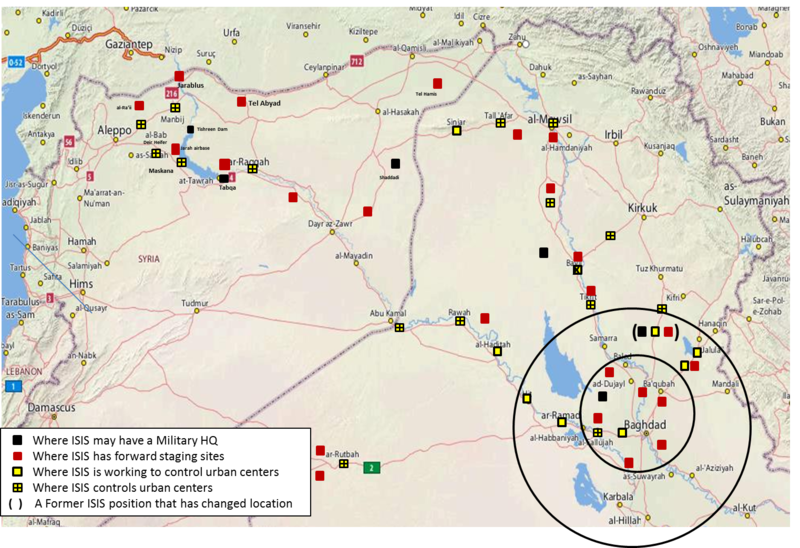 Vehicles reportedly began arriving on June 12, 2014 in the ISIS stronghold of Tel Hamis in Hasaka province around 20 miles south of Qamishli, the provincial border crossing into Iraq. 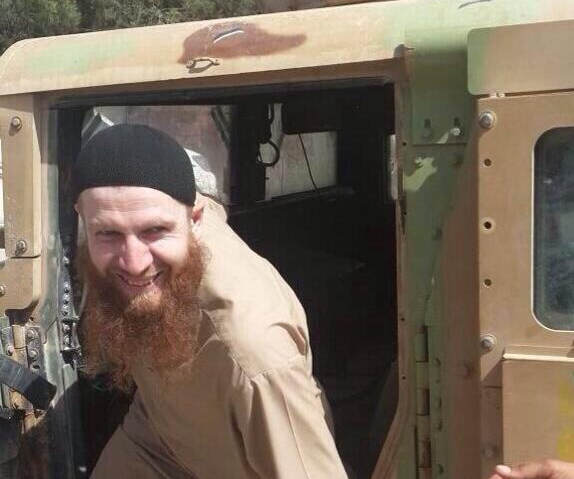 Activists posted photos purporting to show ISIS Commander Abu Omar al-Shishani inspecting U.S. Humvees reportedly transported from Mosul into Syria. 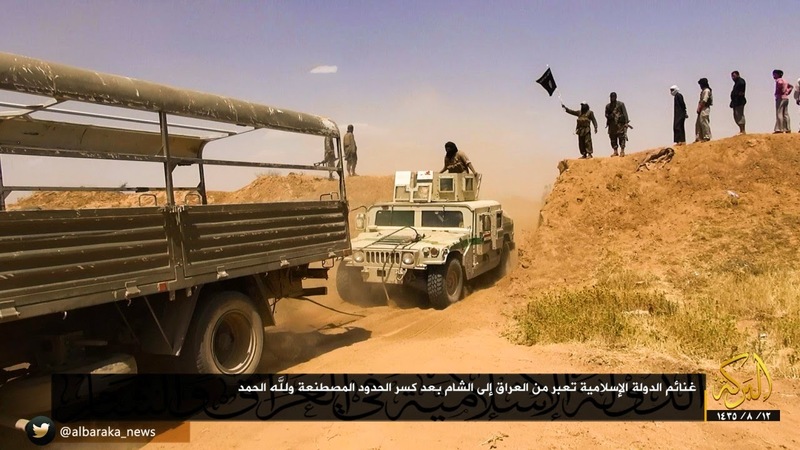 In addition, a video was circulated by pro-ISIS media of a convoy arriving in ash-Shadadi, which lies on the Khabur River in Hasaka province north of Deir ez-Zour and serves as ISIS’s strategic rear across both Iraq and Syria. The infusion of significant military assets and resources into the Syria theater has provoked a regime challenge to ISIS in eastern Syria. In the wake of the Iraq campaign, regime warplanes have conducted numerous airstrikes against ISIS headquarters, targeting the Tabaqa dam, ar-Raqqa city, Tel Hamis, the ash-Shadadistronghold, and a number of other locations along the Syrian-Iraq border in Deir ez-Zour province. These air strikes are a notable escalation in the regime’s disposition toward ISIS, which to date it had largely refrained from confronting. However, while these strike may be disruptive to ISIS’s ability to consolidate and reinforce its effort in Deir ez-Zour province, there are no indicators that they will be successful in defeating ISIS in Syria. ISIS has continued to pursue its objective in the Deir ez-Zour countryside throughout the Iraq campaign, indicating an ongoing prioritization of this effort despite the increased pressure from the Syrian regime. A direct ISIS attack on regime strongholds in ar-Raqqa and Deir ez-Zour provinces could attempt to relieve the pressure inflicted by ongoing regime airstrikes. However, there are no indicators that ISIS intends to escalate against the regime, as it is a course of action that would come at a much higher cost than ISIS is likely to accept. 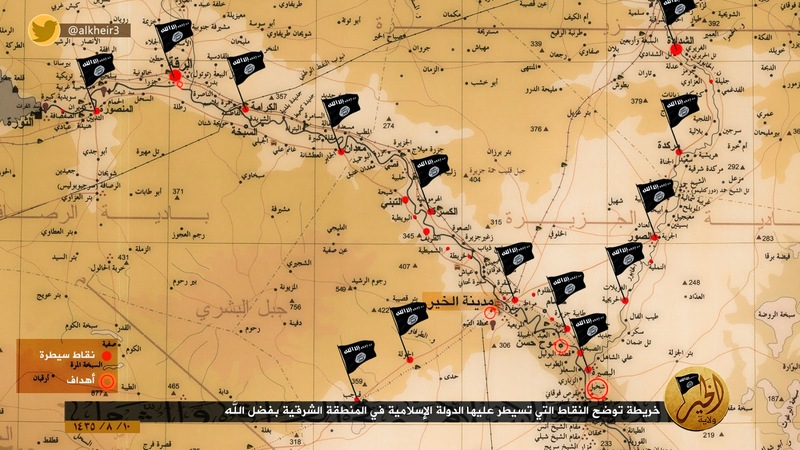 Instead, ISIS is likely to reinvigorate its efforts in Deir ez-Zour with its newfound military assets. In an early indicator of this line of effort, ISIS targeted a nearby JN headquarters with a suicide vehicular-borne explosive device (SVBIED) as it launched a concerted attempt to regain control of the contested al-Basira village on June 17. While clashes are still ongoing, this renewed effort indicates that ISIS is committed to securing key supply routes and oil fields in Deir ez-Zour province. 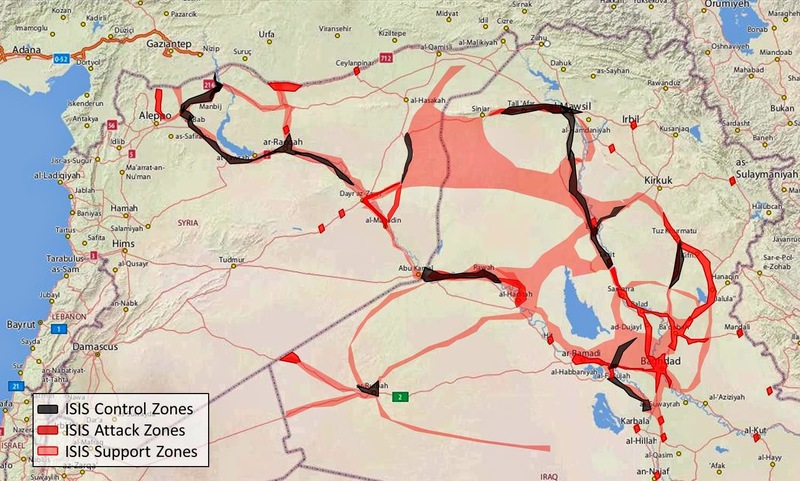 The control of critical supply routes has historically been the first step of an ISIS expansion. With the windfall of arms, men, and cash that it has taken from its gains in Iraq, ISIS may finally have the strength needed to rout other rebels from Deir ez-Zour and to secure full control of its supply lines and oil fields. 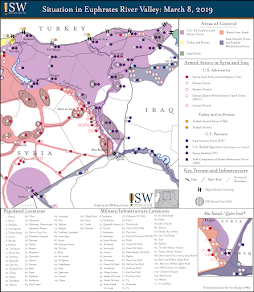 If it is successful, ISIS may launch an expansive push back into western Syria in an attempt to regain territory lost after the outbreak of infighting between ISIS and JN in January 2014.